Back by popular demand: Chinzilla! Check out “4th Amendment for a 5th Chinchilla” for her origin story. There’s carnies; it’s great. Another nice light one for you today, because tomorrow I am coming for your feels. I crave your delicate lady tears. You guuuuuyyyyyssss… Holtzbert Week is almost over. D,: How’d that happen? You have a good time? Anyone planning on submitting some stuff late? (Do it.) Do we want to make this an annual event? 2017. Pentalic Illustrator’s Sketchbook paper; Prismacolor Col-Erase pencil; Adobe Photoshop CS6; Surface Pro 3; Original is 2490 x 1602 px. Erin stops her absentminded humming and peers out from behind her rolling whiteboard to see a fuming Patty stomping up the stairs. “Yes’m?” Quips Holtz, who looks up from her blueprints to a small grey fluff ball being placed onto the table. Curie the chinchilla peers up at Holtz, seeming to smirk at her human mother. “Get your damn exotic monstrosities away from my antique books. This one was trying to nibble on a book from 1860,” huffs Patty. “Don’t do that. Now you’re smirking like these assholes, Gilbert. I’m going to get my lunch, unless these things have already eaten it,” Patty waves them off as she goes back downstairs. “I may or may not have stuffed Chinzilla in there,” Erin shrugs. Chinzilla, the beloved carnival prize won by Erin and gifted to Holtz, is approximately two cubic metres of gaudy chinchilla toy. This isn’t the first time it’s been in the fridge. “Holtz!” Shrieked by Patty from downstairs. “Erin did it!” Holtz yells down the stairs. “Jillian J. Holtzmann! That better not be my laptop cable your soft rats are chewing on,” yells Abby. “I like that you called them soft rats, it makes them sound so much smarter,” Holtz peers down through the fireman’s pole hole at her. Abby glares daggers at her. Sensing the malice in the air, Holtz calls to Payne the chinchilla, cable-devourer, who comes bounding up the stairs and back into her cage. “You have got to get those chinchillas in line, Holtz! They’re destroying the firehouse,” Abby scolds. “Abby, any measure I take to fortify their cage absitively-posolutely will result in them breaking it and escaping. I have given up. They know not to wander too far, anyways. 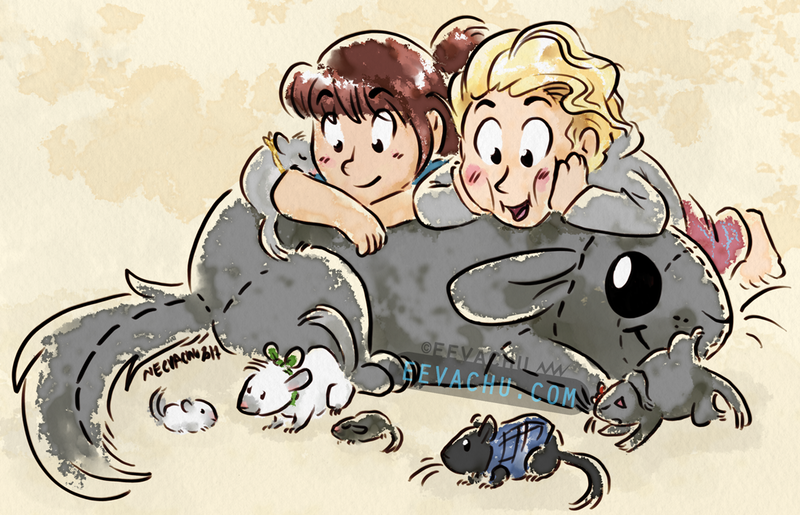 Plus, look how cute they are!” she points to the couch, where Erin is curled up with a scientific journal and Nightengale the chinchilla on her chest. “That’s just because the soft rat is on Erin. You put a woodland creature on her and she looks like a Disney princess,” scoffs Abby. Erin blushes at the comparison. “It’s like she sings and all creatures Holtzmann are under her spell,” mumbles Abby as she grabs the computer cable and walks off in a huff. Holtz comes barrelling down the stairs. Abby and Patty took Kevin to go see a movie his boyfriend said was too scary, so it’s just Erin left on the receiving end of a panicking Holtzmann. Erin prickles at her tone. There’s obvious concern in Holtz’ voice. “Holtz?” She sees her girlfriend’s eyes flit around. “Erin, I can’t find her. She always comes when I shake her treat bag. And now that I think about it, I don’t think I’ve seen her all day. Oh god, I’m a bad mother,” her voice is verging on panic now. Holtz crinkles her brow. Erin runs a calming hand through her girlfriend’s hair. Holtz stills a bit, at least for the moment. “You think she’s outside?” Holtz is wide-eyed in panic again. “No, but I’ll go look anyways,” Erin says as she squeezes Holtz’ shoulder and heads out. Thirty minutes of searching later, and Lovelace is still nowhere to be found. “She’s not anywhere, Erin!” Holtz is trembling and rubbing her eyes. Erin can tell she’s on the verge of a panic attack. “Holtz… Hey, how about you go leave a treat trail to her cage? I’m sure she’s just sleeping somewhere; she’ll follow them when she wakes up,” Erin murmurs as she rubs the small of Holtz’ back. Erin pulls her in for a hug. Holtz tosses and turns in Erin’s arms that night. They still hadn’t found Lovelace. Every crevice had been checked; they had even employed hide-and-seek champion Kevin to consult, once the rest of the Ghostbusters had gotten back. Treat trails had been left, several posters had been made and plastered outside; all they can do now is wait. As Erin watches Holtz so upset, even in sleep, she can’t just wait, so she gets up. “M’babe? Where’re you goin’?” Holtz asks sleepily as Erin’s movements disturb her. “Mmkay,” Holtz turns away and snuggles into Chinzilla, now retrieved from the fridge. Erin wanders the firehouse, listening and thinking where on earth one little chinchilla could get to. Erin hums as she muses, a habit she developed from working in the constant dance party that was Holtzmann’s lab. And then she thinks she hears something. She turns to find she’s standing outside her bedroom. Well… it really wasn’t her bedroom anymore, she slept in Holtz’ room every night and only used this room for storage. Even though they’d already searched here, she opens the door to her now (mostly) unused bedroom to double check. “Must be hearing things,” Erin yawns. “The vents! Of course,” Erin exclaims as she scrambles to her knees and opens the vent beside her bed. She places the vent back carefully, then rushes to get Holtz. She finds her still curled around Chinzilla. “Holtz! Wake up! I found her,” Erin whispers loudly as she shakes her girlfriend by the shoulders. Erin grabs Holtz’ hand and they sleepily stumble to Erin’s old room. “Erin, we already checked in here!” Holtz says in disappointment. “Not everywhere,” Erin singsongs as she crouches down and pulls the vent back off. Holtz kneels beside her and gasps when, lo and behold, Lovelace pops her head out of the vent. Holtz picks up her wayward chinchilla daughter and smooshes her face against her. “Lovelace, I was so-!” She stops, seeing movement out of the vent. Out of the vent hops two absolutely tiny and impossibly adorable baby chinchillas. On closer inspection, Erin and Holtz can see that Lovelace has made a nest in the vent. Erin thinks she probably chose the room because it was so quiet now. “You didn’t know she was pregnant?” Erin asks in disbelief. Erin grabs the tiny wriggly chinchillas as gently as possible. Holtz manages to dig up a small cage to put the new little family in when they get back to Holtz’ room. She places the cage beside their bed, and Erin and her curl up in bed to watch the new arrivals. “How’d you find them, anyways?” Holtz asks. “I think I may actually be a chinchilla charmer, I started humming and I think Lovelace heard me,” Erin chuckles. Erin thinks about it for a long moment, and eventually picks “Wu” after Chien-Shiung Wu, which is in line with Holtz’ naming convention of important badass lady scientists. “And that just leaves little Gilbert Jr. there,” Holtz declares as she points to one of the babies. “Yeah, after you. You found them after all,” Holtz says matter-of-factly. “But I’m not an important scientist,” Erin says it like she’s repeating words she’s heard many times before. Erin smiles, a little misty-eyed and she leans in and kisses her girlfriend sweetly on the lips. Holtz sighs contentedly. Then a thought occurs to Erin and she starts giggling. “What?” asks Holtz, a little hurt. “I’m sorry, it’s just- I’m super touched, but I’m so tired and I just realized you’re a grandma now and I can’t stop laughing,” Erin rolls onto her back and breaks into a full body laugh. Holtz can’t help but laugh along. Fun chinchilla facts: they have super long pregnancies, but the wee little chinchillas come out raring to go. Like tiny round baby deer. They live 15-20 years. What I’m saying is that Kate McKinnon’s throwaway line about chinchillas made me want chinchillas.